PLEASE NOTE THESE CUSTOM MULTI-DAY TRIPS ARE INTENDED FOR LARGER GROUPS (4-5) WITH SIGNIFICANT NOTICE. 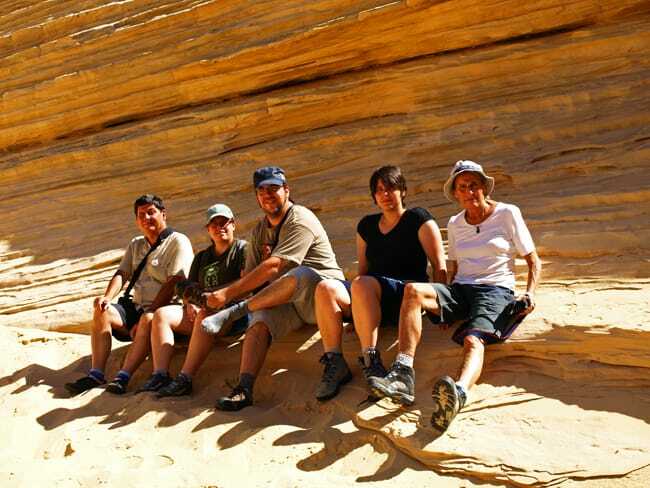 For groups of 1-3 please try to coordinate with one of our single night scheduled trips to White Pocket and Toroweap. It is possible to do these custom trips with 1-3 passengers but it will require a considerably larger budget as the price is a flat rate for 1-5 passengers. Rates are listed HERE. All custom tours require notice of at least two weeks, but availability is questionable that far out. The earlier you plan this, preferably a month to one year out, the more likely we can accommodate you on specific dates. Our Custom Multi-day trips are available from April-October. Our busiest time of year is April-June and September-October. Planning early can assure you get the dates you desire. On our custom built itineraries we can visit any of the locations listed in our Daytours. Zion and Bryce, if desired, can be added but require additional entrance fees. Our custom expedition rates are a flat daily rate for 1-5 passengers. $1750 USD for each 24hr period. Partial Days are pro-rated. Price does not include sales tax on all services in Kane County (7.95%) or public land use cost recovery fee (3.0%). •Extensive tour planning, logistics, customization, and Itinerary building. •Guided Photography/Day Hikes/Sightseeing from both the vehicle and the trail. •Guided Stargazing and Star Photography- The night skies here are some of the best in the continental US! •Luxury camping accommodations, camp toilet, chairs, extra blankets, two layer sleeping pads, etc. •3 Excellent catered meals a day included (except breakfast on day 1). •Outdoor safety. Wilderness First Responder certified guide, satellite communications. All in all you get extensive custom planning, small group transportation, luxury camp accommodations, excellent meals, 24hr guiding/personal camp service, and the best, most natural, backcountry locations in the southwest for around $200-$250 per person per day, depending on party size. We offer incredible value to our guests. Let us prove it to you! Although the planning of these activities is a free service listed above, the actual price of such activities must be borne by the guest and paid to the provider itself. Ask what is available at your destination (s). We know riding in the car all day to any spend an hour or two at your destination is a drag. We design our tours for you to experience the maximum and ride on the highway the minimum. Our hiring process is VERY selective. We select guides that are educated in geology, biology, environmental studies, outdoor recreation, or photography AND/OR experienced as guides at local venues. We ONLY choose guides that have a genuine passion for the outdoors and an interest in environmental protection. Our camping tours destinations are never commercialized “tourist traps”. They are always bona fide wilderness areas, national parks, national forests, national monuments, wildlife refuges, or at least isolated BLM desert. Very rarely will lines or crowds ever be involved in our tours unless a commercialized area is specifically requested by the tour group. Our food is the kind of food you would prepare for your own dinner table. We’ll stop short of calling it gourmet but for a camp setting it might as well be! It typically includes a meat (chicken, steak, pork) with a vegetable or two and a starch. We can also accommodate special dietary concerns with little effort. Consider where you get to eat it too!! You’ll be dining overlooking views captured by no restaurant on earth! While you are not granted unlimited wandering, the freedom factor versus other tours is much greater. We have satellite messengers or radios and handheld GPS which you can use for safety. Most planned hikes will be guided, but if you want to hike up to the top of the hill behind the camp with your loved ones to watch the sunset before dinner, this can be done with a few minor provisions. You will never be in a hurry on a DST tour unless you want to be. This is why pace is considered a planning criterion. We think most people go on vacation to relax. We strive to maintain an ultra-relaxing environment in camp and on the road. Because our company focus is on quality over quantity, because our guides are highly educated and/or experienced, and because you have so much more time overall as well as at the destination, deeper interaction is possible. We encourage as much ground level interaction and learning as possible. Spatially, our vehicles are much more personal than the shuttle bus/divider type so that even on the road our guides are there for you. Whether you are interested in a day tour, week long camping tours, or something in-between, our goal is to offer more value, more service, more nature and more experience to you. Don’t get caught in the tourist trap! Demand more for your dollar! We are certain that if our average customer tried to replicate our camping tours on their own, they would find it not only more expensive in the long run, but also not as interesting, involved, or informative, and much more laborious, frustrating, unsafe, and time consuming.